You might think that this is about your singular ability to affect change, but today it is not. It’s about how you approach planning your day. Years ago I was trained in a program called Work Less, Make More®, developed by the late Jennifer White. Jennifer used the “Power of Three” as an organizing principle for establishing priorities around the unending list of tasks most of us work from. With an aim to combat our tendency to over extend and fill our lives with undue busyness, the Power of Three is a useful model. The Power of Three taps in the Pareto Principle (80/20 rule) which says that 80% of your results are powered by 20% of your activities. Of course, success with your chosen three activities or projects requires that you commit to those three things, above all else. Furthermore, it helps if the chosen projects are, in fact, the best use of your time. I like the Power of Three for big-picture thinking (for example, what are my 3 most important roles in this business, or my three most important goals this month?) 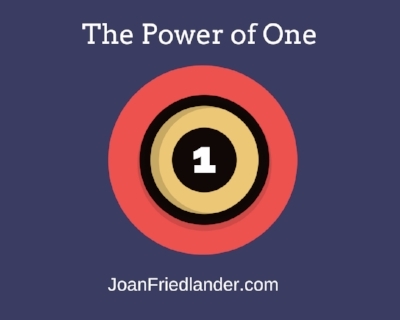 However, I have begun to think that the Power of One is a more realistic model for establishing priorities on any given day. I have noticed that I am more productive and feel a greater sense of accomplishment when I set my sights on accomplishing one significant priority-oriented task during the day. It’s not that I don’t do other things, but when it comes to moving something of significance forward it is more realistic to decide which single project that will be. This kind of focus can be challenging at first. But it is only your mind at play. The mind seems to want everything now. Even when you know what you mostwant to accomplish your greater task will be to ignore your mind chatter. With practice - and success - your mind will be easier to ignore. What experiences do you have with this model, or another like it? How easy - or difficult - is it for you to identify, focus on and accomplish a singular priority project for the day? If you have successfully won the battle of the mind, what did it take?